You have a range of options available when looking for accomodation in Kavieng – from a traditional hotel like the Malagan Hotel, to the relaxed luxury of the Nusa Island Retreat or the affordable comfort of a guest house. Nusa Island Retreat is an environmentally and culturally sensitive accommodation facility with traditional style and charm. Perfectly positioned on a white sandy point with safe swimming and encompassing views it is located just across from Kavieng town, convenient to all facilities. A mix of standard and premium rooms, fully stocked licensed bar and restaurant specialising in fresh local seafood and vegetables. The Retreat has 5 boats catering to most all water based activities. 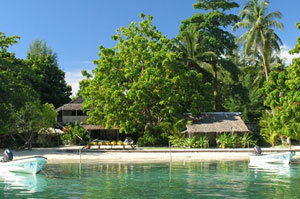 Nusa also conducts tours and activities ranging from snorkelling, fishing, surfing kayaking/canoeing and cycling.